Details: 4 BR, 4 BA Waterfront Residence with 2,815+/- s.f. Misc. 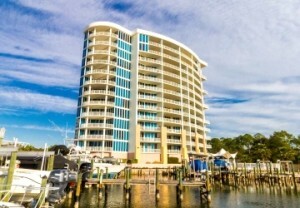 : Orange Beach condo for sale at Bayshore Towers. Sit on your balcony and watch the boat parades, dolphins swimming and hear the wind in the palm trees just below! Stunning views of the blue waters across the bay all the way to the Pass bridge! This complex has a large Marina and boat slips are often for sale! This 89-unit Waterfront Condominium Complex hosts a beautiful Gated Entrance, Covered Porte-cochere, Large Lobby, On-site Management, two Pools, Lap Pool, three Hot Tubs, Jetted Indoor Hot Tub, 26-Slip Marina with Day Slips, Fish Station, two Tennis Courts, Gazebo, Picnic Area, Sports/Croquet Court, exercise facility, Common Room with Bar, TV and Fireplace, Game Room with Round Tables, Pet Friendly, Storage Units, Private Balconies, Many condominiums have Natural Gas Grills and/or Fireplaces, Rental minimum is two months.